When building a comprehensive cybersecurity strategy, the end goal is to keep malware from entering your network and sensitive data from leaving it. As you can probably tell from this blog series on security, it takes more than one layer of protection to accomplish this task. Endpoint security is the middle layer of defense, coming after web and email security, and before network security in your multilayer strategy. It focuses on protecting each device as an individual, rather than as a member of the network as a whole. Endpoint security is especially important in 2018 because of the popularity of IoT devices. Since most of these devices run on a stripped down operating system, they're fairly simple to hack. While it might not feel threatening to have your smart refrigerator become compromised, cybercriminals can use multiple infected IoT devices to create a botnet, which can do much more than just ruin your lunch. 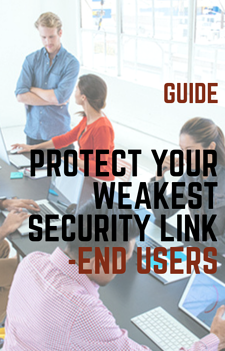 To effectively stave off cyberattacks, you MUST protect your endpoints, as they are the gateways to accessing your network. The definition of endpoint security has become rather ambiguous due to desktop application branding that claims to protect your endpoints. While a program like McAffee or Symantec can secure your device, endpoint security for a business is much more than antivirus. A modern corporate endpoint security solution utilizes a local client on each device as well as a manager client to control them all from one place. This is different from an antivirus program, which doesn't have the bird's eye view of your network that the manager client provides. Endpoint security also includes helpful features like intrusion detection and network privileges, which aren't included in standard antivirus. What Does My Endpoint Security Strategy Need to be Effective? This one seems pretty obvious, but it's a critical step you must take to prevent a security breach. Malware gains access to your network by downloading onto an endpoint and using that device's connections to infect the rest of the network. By preventing that malware from even reaching an endpoint, you inhibit its ability to spread and cause damage. Like we mentioned earlier, an endpoint security service with a manager client makes it way easier to keep track and secure all of your endpoints. If your network were a house, this would be the equivalent of locking all the doors and windows. Since cybercriminals are constantly evolving their hacking techniques, it's near impossible to catch all malware downloaded at the point of entry. Therefore, your endpoint security solution must be able to detect malware as quickly as possible to mitigate the damage done. According to Cisco, the industry average for detecting a cyberattack is a whopping 100 days. By this point, most of your network will have already become compromised and you can only hope that restoring the server from a backup won't cause a huge loss in data. Simply put, the best endpoint security services have the fastest detection. With multiple users on a network browsing the web and downloading files and applications each day, malware has many opportunities to worm its way into your server. And while most endpoint security services offer the ability to scan your network for malicious activity, only some automate this process. For enterprise-size corporations especially, continuously analyzing all traffic on your network becomes a big priority. At the surface level of endpoint protection, every file is analyzed and categorized as safe, malicious, or unknown. Most endpoint security services will then discard the malicious files, begin monitoring the unknown ones, but don't bother with the safe files after being classified as so. Unfortunately, clever cybercriminals have developed malware that can actually pass this first scan as a safe file, only to become malicious later on. Be sure that your endpoint security solution monitors ALL files throughout their life in your network. This is the only way to prevent hidden malware from causing damage. The final component for a truly effective endpoint security strategy is retrospective security. This is a technique developed by Cisco that allows administrators to view the life of every file downloaded on a timeline and then determine exactly when and where a file became malicious. By combining retrospective security and continuous analysis, IT managers can eradicate the file from every endpoint that it ended up on. Retrospective security also allows for a more thorough analysis of malware. IT managers can study the progression of an attack and learn how to prevent similar ones in the future. Retrospective security also bypasses the need for an expensive incident response consultant post-breach, as details on the attack origin are known. To continue reading about retrospective security, check out our blog post dedicated to the topic. Architected by Tekscape, Arma is an end-to end managed security solution designed to protect your business beyond the network perimeters. Integrating components of Cisco's leading portfolio, Arma is a scalable solution that protects your organization throughout the entire attack continuum. This Security-as-a-service solution checks every incoming file with Cisco's massive malware database, TALOS, and detects a breach in 13 hours or less. We've combined this capability with managed services skills that we provide at Tekscape to create the ultimate protein package for protecting your endpoints.